Please take the time to read her poems. Share Mary with someone who needs her. Through us (or more specifically, the practice of all 8 limbs of yoga), compassionate artists live on forever. Now on to the events and workshops we want to share with you this week. Make sure to hashtag #NJyogacollective so we know what inspired YOU! And also add our hashtag to any Mary Oliver quotes you choose to post. We’d love to see them all in our IG collection at the end of the week. Repetitive motion injuries are occurring in younger and younger athletes as many kids specialize in a sport earlier than they have in the past. In addition, competition at a younger age has intensified. So how can we help young athletes stay healthy and enjoy a long career in their sports of choice? A wonderful tool that is often overlooked is yoga. Come to Firefly and learn how to incorporate it into your little ones’ lives! Develop a steady and insightful mind while setting intentions in harmony with your deepest dreams during a 60-min Yoga Nidra practice. Ellen will guide you through pranayama and gentle floor movements to settle the body, ease the breath and cultivate receptivity. Then set your intentions during the light of the January Full Moon. As the session continues, you’ll relax in supported Savasana and be guided through a Yoga Nidra practice while hearing the healing. Get your Funky Friday Night started right with this vinyasa flow based class. While flowing through several rounds of Sun Salutations. The last 30 mins of class will end with a warm mini restorative reboot. Set in a heated room of 85 degrees. All Fracking Levels Welcomed. The Beautiful Ryan Gervasi is coming back for our 2nd women’s empowerment circle. A women’s circle is an intimate gathering where we learn new ways of speaking, listening and relating to others. It is a place where we discover and integrate new blueprints that serve the women we are becoming. As each woman claims her seat in the circle, we come together as equals united by our common purpose. Create the life you always dreamed of! Manifestation and Abundance through the use of a vision board and other tools that will set your soul on fire! Please bring any supplies you would like to use for your vision board! Some materials will be provided. Join Edie for this fun workshop that will include yoga, guided meditation and discussion, followed by an arts and craft project! Design and decorate your own gratitude jar to take home and put to good use in the new year. Start off 2019 with an open and thankful heart and resolve to count your blessings! This workshop is suited for yogis (and crafters) of all levels of experience. Most people approach beauty just looking at the exterior, but have you ever seen someone who may not be your typical definition of beauty, but who are radiant? You are pulled in by something and cannot look away? That is what we address with Kundalini yoga: the activation of the Radiant body. Join Kundalini Yoga Teacher and Integrative Nutrition Health Coach Csilla Bischoff of Shining Health Holistic Nutrition Counseling for an inspirational afternoon of youthfulness, vitality and joy. We will combine kundalini yoga, meditation, breathing techniques and other yogic secrets for amplifying one’s radiance, magnetism and beauty from within. Csilla will also share her best tips for creating gorgeous skin from the inside out and outside in through using food, herbal infusions, self care rituals and essential oils. In this inventive workshop we will explore, in a playful way, transitions and connections between different yoga poses. Challenge and improve your balance, strength and proprioception. Deepen your understanding, your sense of direction and the spirit of practice. Join Jamie for an experience of yoga and connecting to spirit, to nurture a path of reconnection to your physical vehicle. Regardless of age, ability, size, race, gender identity or any other identifying labels society places on us as humans, we can all benefit from deepening the relationship to the vessel that carries us through this lifetime. We will use tools of archetypes and oracles for guidance, practice loving kindness and acceptance based meditation, and deeply connect with the breath from a place of cultivating relaxation. Through an empowering yoga practice balancing sthira and sukha (effort and ease) we will rekindle our inner fire, building physical and emotional strength. Time will be allotted for reflection, journaling, tea and community. Feeling stressed, worried or anxious? Join Bridget Lyons for a powerful Mantra Meditation w/Crystal Grid to penetrate the subconscious and re-adjust your energies to relieve anxiety, stress and worry. Mantras are positive affirmative phrases we’ll be meditating to. Bridget will introduce you to tools that you can leverage both on and off the mat. Did you know that it is possible to be too flexible? Hypermobility syndrome is gaining more awareness in the yoga world, with up to 60% of yogis displaying signs of hypermobile joints. If you feel that you often have joint pain, instability, and/or weakness in your asana practice and in everyday life, this workshop will help you understand if hypermobility may be a factor. In this workshop we will explore what exactly hypermobility is, and delve into how to keep your joints healthy, supported, and strong in your yoga practice using props and refined cues. Great for both yoga teachers and students! Sound healing uses vibrational energy to cleanse and balance your energy centers (chakras), place you into a state of deep relaxation, and it promotes healing (mentally, physically, and spiritually). This special workshop combines the benefits of the Himalayan singing bowls, which will be played by Tracy Hart and the gong, which will be played by Kim Giglio. Kim will play the gong as you relax on your spine. The vibrations of the gong help facilitate release – old thought forms and ways of being can be cleansed out of the energy system. It is a cleansing process for the subconscious mind. During this time Tracy will be playing a Himalayan healing singing bowl on each person’s heart center to enhance the release of unwanted energy and to help manifest positive intentions. Tracy will play a chakra set of Himalayan singing bowls to align and balance the energy centers and promote relaxation and healing. Then continue to release what is holding you back as Kim plays the gong over each person’s body. This is a powerful Gong Bath, we will journey into deep relaxation with a Large Earth Gong, Celestial Wind Chimes and Native American drums, as we break up the energy blockages and clear out old stagnant emotional debris. Adrienne will perform an Aura Cleansing on each person, using Sacred Herbs & Incense.This Healing will Clear and Purify your Aura & Energy field, sweeping out what no longer serves you and creating room for your new dreams & visions. Yin Yoga is a passive and meditative practice, targeting the connective tissue and joints in the body – rather than stretching muscles. This practice increases our flexibility and range of motion in a deep and effective way, may increase bone density, and enhances our vitality and overall heath. Since there is a strong meditative component to this practice, it has a calming effect on our mind and is an excellent way to counter balance a busy life. 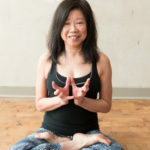 During this workshop you will learn: – the 3 main principles of Yin Yoga; – the reason for holding Yin postures several minutes at a time; – the difference between muscles and connective tissue; and – a Yin posture sequence you can practice at home. Both beginning and experienced yogis will enjoy this workshop.